You get the weirdness of this picture right off the bat. 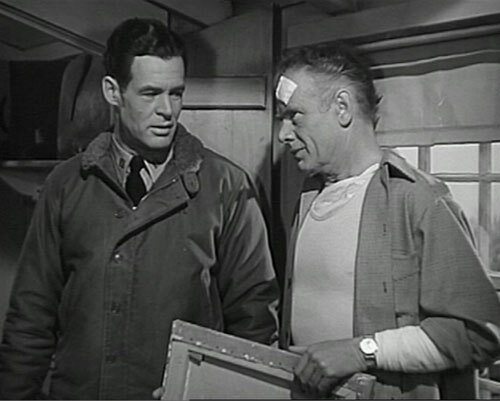 After the opening credits, white type above images of surf colliding with rock, there are three establishing shots, like so: we're at a Coast Guard base, check; here are the quarters of one Lieutenant Scott (Robert Ryan); and here is Scott, sleeping. Then, boom, we are inside of his nightmare, which, we ought to presume, is based on a war trauma, the sinking of a ship that he managed to survive. And here's Scott, now at the bottom of the sea, treading on bones as he advances toward a beautiful gowned woman. I can't think of any other film in which we are introduced to the dream life of a character prior to seeing his waking life, and perhaps it's a touch such as this that moved director Jean Renoir to remark in his memoirs that this, the last film he made in Hollywood, "was the sort of avant-garde film which would have found its niche a quarter of a century earlier, between Nosferatu the Vampire and Caligari." He does not address what Jacques Rivette deems the film's "mutilation," nor does he discuss his conception of the structure. In any event, this is the kind of film maudit that will ever exert a strange fascination, for what it omits as much as for what it contains. Ryan's Scott is a haunted man who can't set his life right despite what he's got going for him, which, true to form in certain postwar pictures, include the love of a good woman—Nan Leslie's Eve, who any normal fella would be delighted to settle down with. 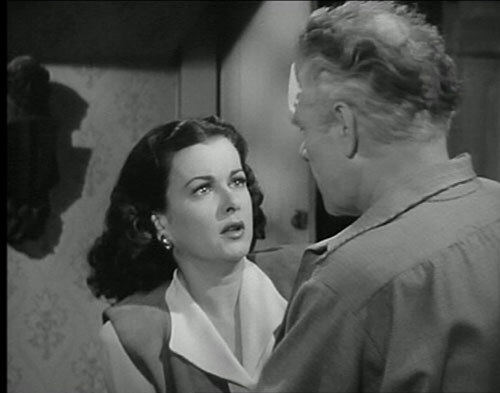 A chance encounter with Joan Bennett's Peggy unfolds into what looks like a blatant invitation to self-destruct implosion. Peggy is the terribly unhappy wife of Tod Butler, a famed painter who's now blind. Tod has an oddly assured manner that leads Scott to believe that he's faking his blindness, using it as a method of getting his way and exacting some kind of revenge on Peggy, his former reputation, the world at large, all that. For his part, Tod claims to like Scott, and makes it very clear that he wants to cultivate him as a friend. Charles Bickford's performance is quite magisterially creepy. "You play chess?" He asks Scott. When Scott answers in the affirmative, he says, "Good, I have a lot of fun." He might as well be saying, "Good, I enjoy pulling out the hearts of babies and concocting a sort of paté out of them." I mean, the guy's utterly creepy. And if he doesn't give off the impression that he's faking his blindness, we do see, right off the bat, that he knows that Scott's drooling over Peggy. As, we shall learn, at least one other ill-fated fellow in the vicinity had done before. After Scott's experiment to determine the reality of Butler's blindness ends in disaster (among other things, Butler lives through it), the instant amour fou between Scott and Peggy intensifies—"I knew you'd come. "/"I knew you'd be here," that sort of thing—and Scott's own blindness comes to the fore. He can't seem to recognize that Peggy's not just, you know, fun crazy, but actual crazy. As he alienates everybody who's interested in actually helping him, we see he's a sick man who's in love with his own sickness and wants to sustain and nurture it until it finally...kills him? Robert Ryan played such a character almost exclusively throughout his career, but his performance here has a horrific intensity that's almost a mirror image of Bickford's. 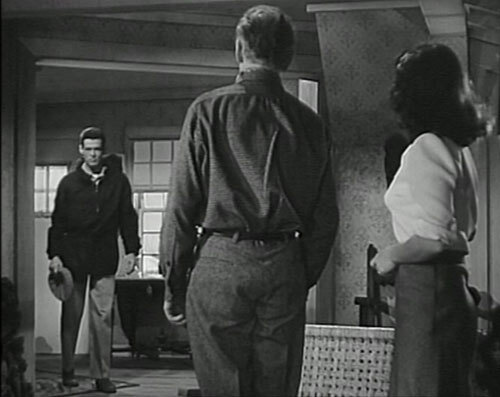 Near the end of the film, Scott insults Eve as he rushes to the Butlers', saying, "I've got to find out about myself once and for all." The frustrating thing about the film in its final form is that it withholds Scott's self knowledge, and in fact ends with a world still in chaos. Rivette noted that Beach "looks like a film made by Fritz Lang" (and that's at least in part due to the presence of Joan Bennett) but continued "[Its] tragedy does not stem from the inexorable movement of some force of destiny, as in Lang's films, but on the contrary, from fixation and immobility; each of the three characters is frozen in a false image of himself and his desire." Perceived in this respect, the mere 71 minutes of this film seem as compressed as they have to be; the incompletion, the lack of consummation, as it were, seems the most important component of the film's overall scheme, mutilated or not. On the one hand, it’s great to have attention drawn to this film here; on the other, I sort of wish this didn’t ‘t have to go into the Foreign Region DVD Report — that a person in the US should be able to just pick it up at the store. It’s, I think, the best American Renoir, and, in its differences from his other films, the one that most reveals the most about his style. Glenn, if you haven’t read Janet Bergstrom’s superb essay about the evolution and mutilation of this film, I think it’s well worth tracking it down, even though (alas) you may have to pay for it online at http://www.jstor.org/pss/3815261. I originally discovered this piece through its French translation in Trafic, a French magazine I write for. It’s almost certainly the best source of information for the original form of what (I agree with Ignatiy) is probably Renoir’s best American film. P.S. My mistake—I don’t think it’s available online at all, even for purchase. But it can be found at any library that stocks volume 11 (1999) of Film History (an excellent journal, by the way). As to opening with a character’s dream life, Eight and a Half is a good example of that, from considerably later. 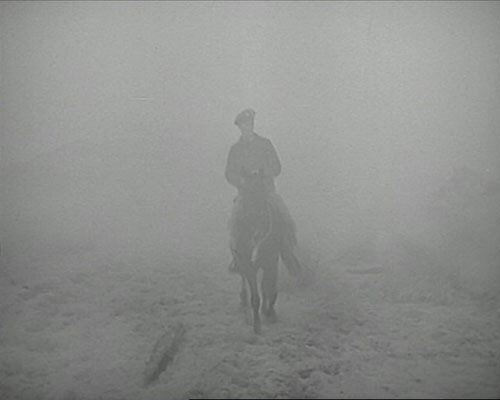 Even Wild Strawberries grounds the audience in waking reality before letting loose with that nightmare. In 1947 nobody was doing that kind of stunt, as far as I can see. Yes, I ought to have been more precise there and said “I can’t think of any other film prior to this one” that opens in such a way. Obviously there are several since that do, including 8 1/2 and Strawberries…and Rushmore. And so on. But maybe I was just laying bait for a discussion of this kind of character introduction…wink, wink. It seems a really GOOD way to introduce a character, and start a film with a bang, but I can see how in the 40s, when the tradition was to ESTABLISH everything, there would be pressure to set up a character’s life in a conventional way before we see them getting chased around by a giant syringe or whisky bottle. What about MOONRISE by Borzage? That has this extraordinary montage that opens the film and it seems to take place in the fevered rage of the main character. Anyone want a DVD copy of this film? Sound and picture quality both excellent. Contact me if you’re interested. It’s really one of the most striking films I’ve seen, with a mood all of its own. If I remember correctly, Peggy stays with Tod and Scott (Ryan) seemed to go off on his own. What happens to him is left open at the end of the film.